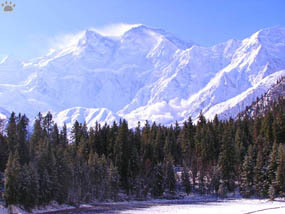 Nanga Parbat (8125 m) and Raikot Glacier. On its way to the plains of Punjab, the Karakoram Highway (KKH) follows the canyon of Indus River - one of the deepest gorges on our planet. 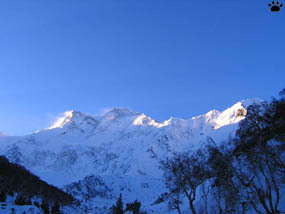 It crosses the mountains known as the Lesser Himalaya, dominated by Nanga Parbat Range. 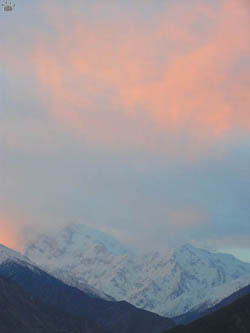 View of Rakaposhi Peak from Raikot Valley across the Indus. It's more than 6500 m from the river to the summit. The main valley in this area is scenic, but very dry and barren. To see colorful villages, forests and alpine meadows, you need to climb into one of the side canyons. 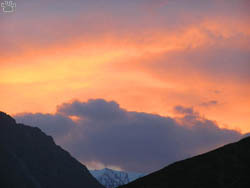 Sunrise over Nanga Parbat ridge. 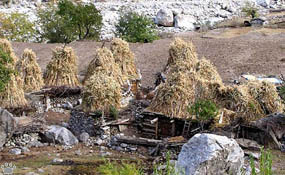 Haystacks and drying grain on rooftops, Jeel village. Jeep ride to Jeel. The hike up Raikot Valley to Nanga Parbat base camp is said to be the best short trek in the Himalaya, but the road to the trailhead in Jeel is one of the scariest I've ever seen. It climbs 1000 m in the first 5 km. On the way back down, it's better to walk. 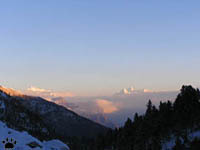 Trees of Raikot Valley, left to right: Himalayan cypress (Cupressus torulosa), Himalayan spruce (Picea smithiana) with Kashmir white pine (Pinus wallichiana), Central Asian juniper (Juniperus semiglobosa) with Ladakh willow (Salix ladakensis), Himalayan blue pine (Pinus gerardiana). White-browed bush-warbler, Jeel. Raikot Valley is a good place to see some uncommon trees of Western Himalaya, and lots of interesting birds, such as white-browed bush-warbler (Leptopoecile sophiae). Birds of Raikot valley, left to right: chestnut-bellied nuthatch (Sitta castanea), yellow-crowned kinglet (Regulus regulus), plain-backe thrush (Zoothera molissima), pied bushchat (Saxicola carpata, two photos), black-throated accentor (Prunella atrogularis). 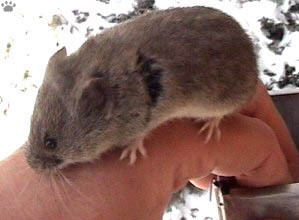 Mountain vole Alticola albicauda, Raikot Valley. 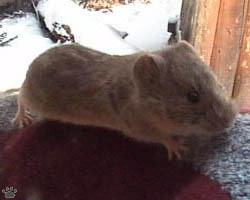 Mammals are also interesting: here you can some find little-known rodents such as mountain voles. Mountain voleA. 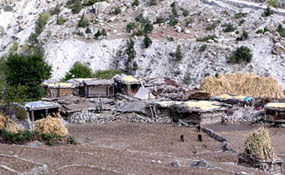 fertilis, Raikot Valley. 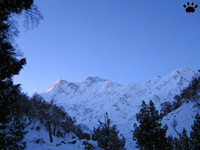 Habitat of woolly flying squirrel, Raikot Valley. 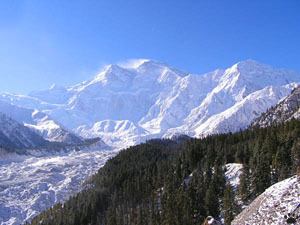 Note an avalanche on the slopes of Nanga Parbat. reach 10 cm in diameter. 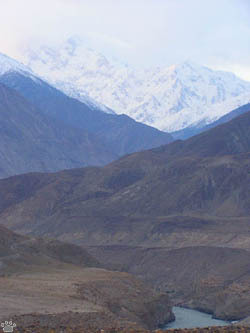 Raikot Valley. The rarest creature of Northern Pakistan is woolly flying squirrel (Eupetaurus cinereus). 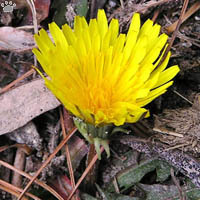 No naturalist had ever seen it in the wild until I found a couple in Raikot Valley. The world's largest squirrel (more than 1 m in length), it spends days in small caves in rocky cliffs, and feeds in the forest at night. woolly flying squirrel. 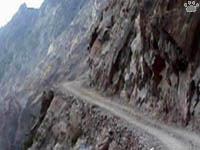 Raikot Valley. Snapshots from the first ever video of a woolly flying squirrel (sorry for the quality - the video was taken at night during a snowstorm) and a photo of its tracks. 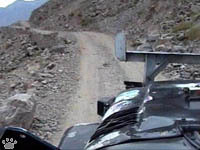 Raikot Valley. 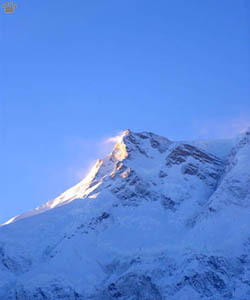 Summit of Nanga Parbat, locally known as Diamir. These animals are strictly nocturnal. I found them by their calls, but they can also be located by tracks leading from cliffs into the forest (right). 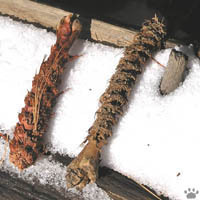 Tracks of a woolly flying squirrel (shown by arrows). 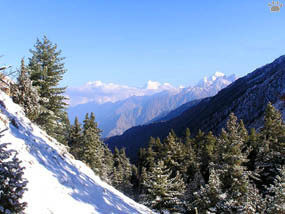 Treeline near Nanga Parbat. 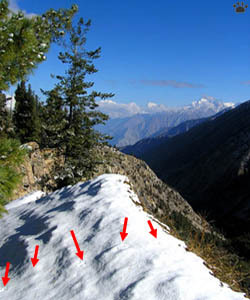 Eventually, the trail reaches the tree line and then the Nanga Parbat base camp. If you make it that far, you'll be awarded with some of the world's best views. Unless, of course, the weather is too bad. View down from the tree line.